Lambda Solutions, a provider of open source talent and learning management systems, today made its Lambda Analytika data reporting and analytics solution available for the Moodle LMS. "Moodle users now have access to a real reporting and analytics solution to better understand their learners, improve learning programs, and accurately assess the effectiveness of learning and its impact on business," said Stewart Rogers, director of product management at Lambda, in a press release. User Grades By Activity Report and User Grade by Course Report, for reviewing grades by course and activity. In addition, to help users get up-to-speed, Analytika features updated help documentation as well as new sections on "Getting Started with Analytika" and "Uploading Security Bundles for Domains." "Analytika is helping us solve many of our reporting issues that previously took days of spreadsheet creation and manual data entry," said Chantal Hollander, director of IT at Adler International Learning, an early adopter of the technology. 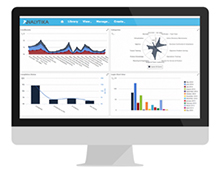 "Analytika now delivers the same reports in seconds." For more information, visit the Lambda Solutions site.